Could Astronaut Crops Survive Space Radiation? On April 26,1986, Reactor Number Four at the Chernobyl Nuclear Power Plant exploded and the reactor burned for days afterwards. It was the worst accident in the history of nuclear power, releasing radionuclides over parts of what today are Belarus, Ukraine, and the Russian Federation. On April 28, 2009, the Advanced Land Imager on NASA’s Earth Observing-1 satellite took this true-color picture of the nuclear reactor. Mixing with the network of abandoned buildings, water channels, and roads, areas of green appear—a testament to the vegetation that was growing around the site some 20 years after the accident. Radioactivity lingering in the soil near the site of the Chernobyl nuclear power plant accident has not prevented life from creeping back at the Ukrainian site. Now researchers have discovered that oil-rich flax plants grown in the highly radioactive soil can apparently adapt and thrive with few problems. The first generation survived with changes in barely 5 percent of the plant proteins, and researchers have also collected results from a second generation of flax grown in a radioactive plot of land near Chernobyl. But a mystery remains as to how the flax – a source of plant fiber and dietary oil – has adapted biochemically to the highly radioactive environment. Either way, researchers have been surprised to see that "the radioactive Chernobyl area is not a desert, but is full of life," according to Martin Hajduch, senior scientist at the Slovak Academy of Sciences' Institute of Plant Genetics and Biotechnology. "My favorite speculation is that when life on Earth was evolving, radioactivity was much more present on Earth's surface than is today," Hajduch said. "And so the plants are somehow 'remembering' it, [which is] what helped them to adapt in Chernobyl's radioactive area." Radioactivity is a clear and present danger for life on Earth since the earliest days. Lesser amounts of atmospheric oxygen meant that the planet lacked its protective ozone layer, which blocks out much harmful radiation from the sun. That in turn gives support for the idea that life originated underwater where it had some protection, researchers say. Scientists had to wear masks, goggles and gloves to work in the area. Given life's ability to arise in the more radioactive environment of an early Earth, there's little surprise that plants and other organisms can adapt to and tolerate radiation. But the recent flax study helps confirm the idea. The Slovak researchers chose to focus on the proteome array of proteins rather than the DNA of the plant genomes. That's because past research by Hajduch suggested that transcript levels won't necessarily translate into the changed plant proteins, which means that altered gene expression may not affect the plant's physical survival. As a postdoc, Hajduch had helped Jay Thelen, a biochemist at the University of Missouri-Columbia, compare the differences among the gene expression and proteins of the model plant Arabidopsis thaliana. Their results showed just a slight majority of the proteins and gene expression pairs agreed with one another. "So even if we will detect some changes on genome levels in plants grown in the radioactive Chernobyl area, there is about 50 percent chance that it will not followed by protein abundance," Hajduch explained. Hajduch and his colleagues grew the flax plants in both a radioactive Chernobyl plot and a non-contaminated plot in the local town, before harvesting the flax seeds for analysis. They found just 4.9 percent of proteins changed out of the 720 protein spots that they studied. Soybean plant growing in radioactive soil. Despite uncertainty about how the protein changes have helped the plants shrug off the local radiation, researchers identified certain changed proteins related to how plant cells send chemical signals to one another. The flax study results also compare well to an earlier study that looked at soybeans. In both cases, the plants experienced a low percentage of protein changes – but the flax seeds accumulated 10 times less radioactivity than the soybean seeds. The flax study was detailed in the Sept. 15, 2010 issue of the journal Environmental Science & Technology. "Now we are preparing the manuscript from the second generation of plants where we compare protein abundances through seed development between plants grown in radioactive and control Chernobyl fields," Hajduch said. This artist's concept shows how a Mars habitat might look, with crops being grown in a greenhouse. 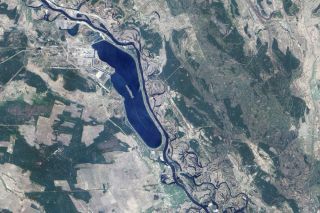 The radioactivity levels in the Chernobyl soil don't necessarily compare with the intensity of the radioactivity found in space or in extraterrestrial soil. But the Chernobyl experiments could help define the radiation tolerance among plants that may eventually become crop candidates for space colonists on the moon or Mars. Few radiation experiments have been done on plants in space. One experiment currently underway will test the UV resistance of Arabidopsis seeds on the EXPOSE experiment of the International Space Station. Such tolerance may prove especially crucial if crop seeds must make the long, possibly six-month journey to Mars. The plant seeds could suffer exposure to higher levels of radiation from the sun and high-energy cosmic rays on the spacecraft, unless the spacecraft has shielding to make up for the lack of protection from Earth's atmosphere. Even assuming that the seeds reach Mars without much radiation damage, they would also have to deal with the higher levels of radiation on the red planet's surface. Knowing that some plant seeds can deal well with certain radioactivity levels could ease concerns about how much shielding is needed. Yet radiation represents just one concern for future space crops. The lesser influence of gravity is another factor on a planet such as Mars. But plants seem to do well even in such microgravity conditions – wheat seeds flown on the Russian space station Mir managed to sprout back on Earth. Soybeans and other would-be crops also have thrived on the International Space Station. Perhaps a greater challenge for Earth plants won't necessarily come from the familiar threat of radiation. After all, researchers still don't know how well plants can deal with growing in extraterrestrial soil.